Hoping you are not going to catch me out ladies as I am prematurely writing this as a mad week ahead with the Friday 5 looming (and Milly with Dance rehearsals all week with 4 shows next weekend!!). Hoping that Paul bakes another batch of his Pecan and Date Squares for Friday night as that may well keep me going. Anna M caught me out last month so I must start by congratulating her on being the 9th lady home at the Culford Sprint Triathlon. Sitting writing this in the rain although this morning we were all sunning ourselves in a random public garden that Rodger had found in the centre of Coggeshall after we all successfully navigated another great trail run. If you haven’t tried one yet, they are a must. Rodger the legend was up at 4.30am to set it all up!! Loads of us ladies sacrificed our lie ins and we had a couple of dogs along for company too. No idea who won and, although Rodger wants us to take the competition seriously, I do struggle not to relax and enjoy it on a Sunday morning. This month (and next) are when the 5k season reaches fever pitch. There have been 2 Mickey Edwards, 1 Harwich, Clacton, Parkruns and a 5k in Maldon. Whilst I remember, I heard on Thursday that Harwich starts their very own Parkrun on 1 August. Sam Godden had a fab run at Maldon taking herself up to 5th in the all-time list with a time of 20.17. Alison D did her first 5k and a great time in 23m 25s. The first Mickey Edwards of the month was a stonking performance for a lot of the women with 18 women improving their time (not me L) with 6 women taking a further chunk of their times at the next Mickey Edwards (4 women took their times down at both). Simone, Jenny, Karen and Davina all making significant reduction in their 5k times. Caroline was expertly paced by Dusty and Shawn to finally give her the first standard she has worked so hard for. Out at Harwich, the girls may not be at top of the leader board but they seem to be having their own GBRC tussle with Cherie leading the blue vests in the leader board, Lesley one place behind, then Claire G, Davina and Rita only a few places below. Vicky Law has also been running strongly at the series. Linzi is currently being outshone by her daughter at the Clacton 5k, little Megan Hughes is stealing the show with 2 wins in the Junior Race. Well done to Caitlyn as well who is also running more strongly. Away from the 5ks, there have been a couple of endurance events. Anna M was the 8th lady home at the Stour Valley Marathon in 4hr 42m (although a bit longer than a marathon and off road) with Meera not far behind in a time of 4hr 55m. I may have to come and join you next year as long as it is not a week before a 24 hr event. Nine of us ladies then travelled to Endure – Janine, Sam, Chusa, Helene, Tonie, Lara, Davina, Steph and me. Apart from Chusa who obviously has an aversion to camping, we covered 250 miles between the 9 of us. Not bad!! Weather was kind to us, fab course and great company made a very very tiring but enjoyable weekend. There have been a flurry of 5 milers with the height of the Friday 5 series at Kirton, Stowmarket and Bury, Capel 5 mile, Wymondham 5 and Maisie’s 5 mile race in Clacton organised by our own Brian Telford. Claire G has run strongly at all the Friday 5’s and is currently lying 2nd in her age group with 1 race to go. Debs, Sue T, Karen and me joined her at Kirton on a very hot night, (just glad we all got round on that night !!). Katie ran the children’s race and came 4th. Jo McKay may have moved away but her performance at Wymondham shows she is still running strongly with a silver standard in 38m 44. Davina, Louise and Linzi all gave Maisie’s 5 mile race a go – I was hoping to run too but can’t fit everything in at this time of year. 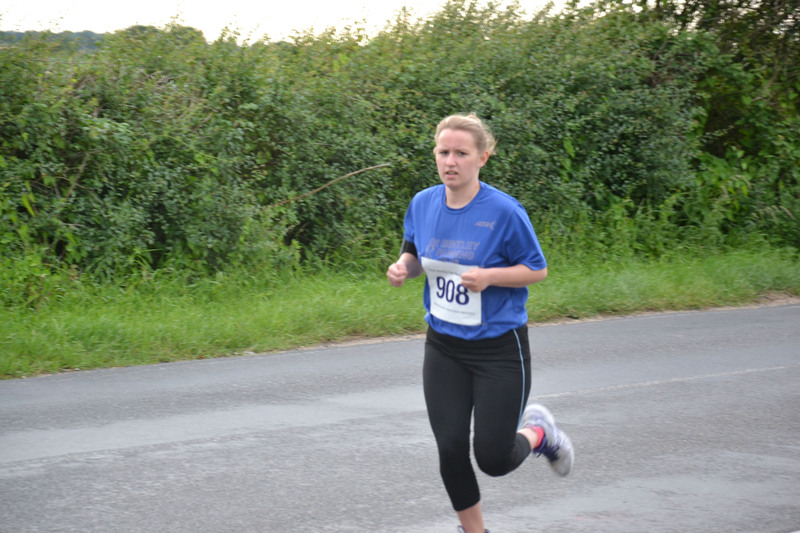 Lastly, Karen not only is running strongly in 5ks but also in 5 milers winning her age category at the Capel 5. To finish, the Harwich triathlon where Sam, Anna, Lorna, Lesley and Tricia all competed. All did themselves proud on an afternoon where you could tell by the lousy weather that it must be another Harwich Sprint Tri. Sam and Lorna both won their age groups. I think Sam came third but I can’t find the results and I am sure her trophy which I saw on Wednesday said 2nd overall – confused.com!! It takes a lot of work to compete in all 3 disciplines and I hope all 5 are proud of themselves with all the great times they achieved. Before I round up with my Runner of the Month, I must thank Tonie for helping me out with the Juniors earlier in the month for their presentation evening. A great evening and loads of young female talent on show. Well done Amie for being the XC Runner of the Year chosen by all of the Juniors that competed last season. Friday 5 this Friday and thanks for all the volunteers, a last beg/plea to fill up the tables with loads of lovely cakes and sandwiches. Any questions on what you need to do, please speak to Russ or me. Lastly to my Runner of the Month – Lesley and I have had to ponder long and hard, was it going to be Karen, Lorna, Tricia, Caroline, Meera, Anna M (you newer ladies are on such an upward trend that we are counting you out for a few months….!!)? However, we have decided on another person who has knuckled down to training in the last few months and we have both seen a huge improvement in terms of commitment which is turning itself into performance. She reduced her time at both Mickey Edwards races, got a new 5 mile PB at Bury 5 and took part in Maisie’s 5 mile race. She even remembered to bring her number for the last Mickey Edwards race!! So this month, my Runner of the Month goes to LOUISE REEVE. Well done Louise, both Lesley and I are looking forward to seeing how you compete at the last Mickey Edwards and Ekiden.